A data logger is a device that records data over time or in relation to a location either with a built in instrument or sensor or via external instruments and sensors. These days, data loggers can come in small, battery powered, portable, and equipped with a microprocessor, internal memory for data storage and sensors. Some data loggers interface with a personal computer, and use software to activate the data logger and view and analyse the collected data, while others have a local interface device (keypad, LCD) and can be used as a stand-alone device. Temperature Controls represent several brands with a multitude of experience in data acquisition and logging of various applications. Based in the UK, Grant Instruments is a world leader in the manufacture and design of equipment for sample preparation, scientific analysis, data acquisition and data analysis providing solutions to the global scientific and industrial markets. Novus was founded in 1982 in Brazil and have commercial offices all over the world. Specialists in data acquisition and single loop control, their products are welcomed as an industry standard. 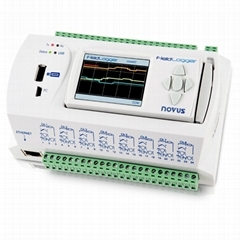 Through consistent product development Novus’ range has expanded to include controllers, temperature and humidity sensors and transmitters, pressure transmitters and data loggers. Tecnosoft was founded in Italy in 1989 originally as a research and development company for data acquisition systems for third party companies. Since 2002 a new line of Tecnosoft branded monitoring devices have been developed for applications including temperature, humidity and pressure. Tecnosoft apply their knowledge to a range of fields including pharmaceutical, food & beverage, energetic laboratories, environmental and medical applications.